They are intense, passionate and extremely careful in life. They have a strong sense of themselves and will make sure what they say is exactly what they want to say and not anything more. They question everything, cautious about everything and is never naive. 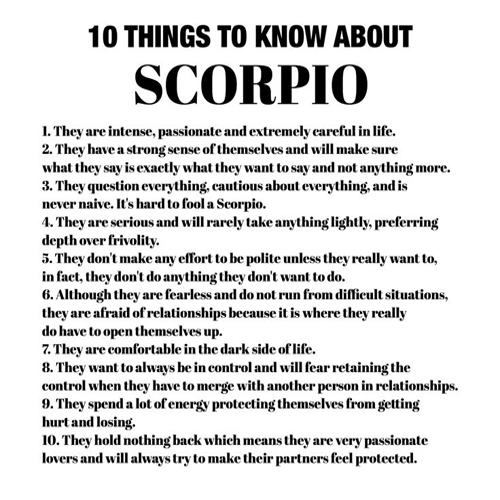 It's hard to fool a Scorpio. They are serious and will rarely take anything lightly, preferring depth over frivolity. They don't make any effort to be polite unless they really want to, in fact, they don't do anything they don't want to do. Although they are fearless and do not run from difficult situations, they are afraid of relationships because it is where they really do have to open themselves up. They are comfortable in the dark side of life. They want to always be in control and will fear retaining the control when they have to merge with another person in relationships. They spend a lot of energy protecting themselves from getting hurt and losing. They hold nothing back which means they are very passionate lovers and will always try to make their partners feel protected.